Now before I start with this story I must say that we are not the best fish caching people. So if you happen to be a good fisherman then it would probably be a good idea for you not to read this, because you would get a heart-attack. 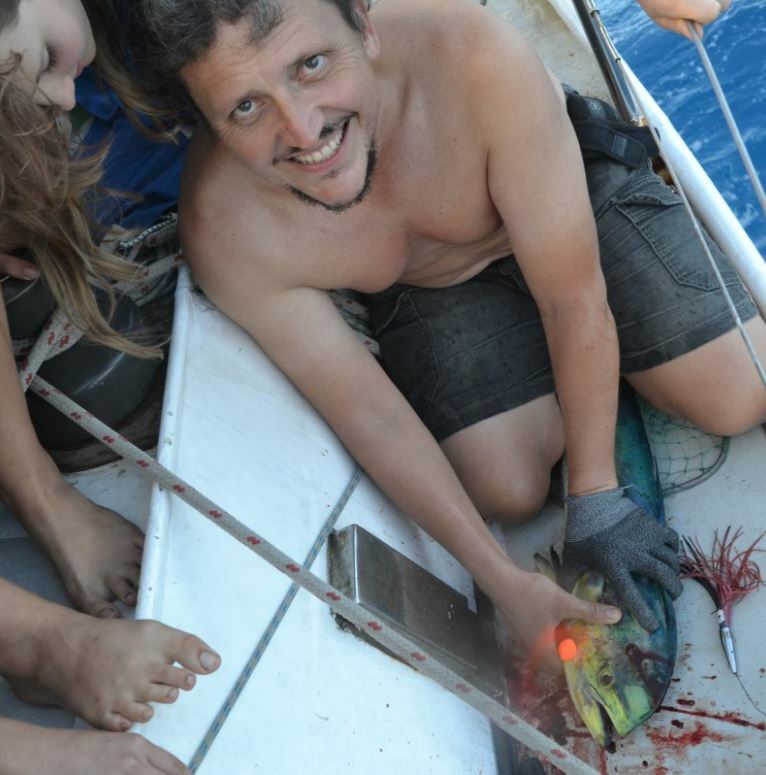 We as a family have a very interesting history with fish, for example: the first fish did not want to die and we had to kill it with the winch handle there was blood everywhere! Lost our lure once because we forgot it out over-night, etc. 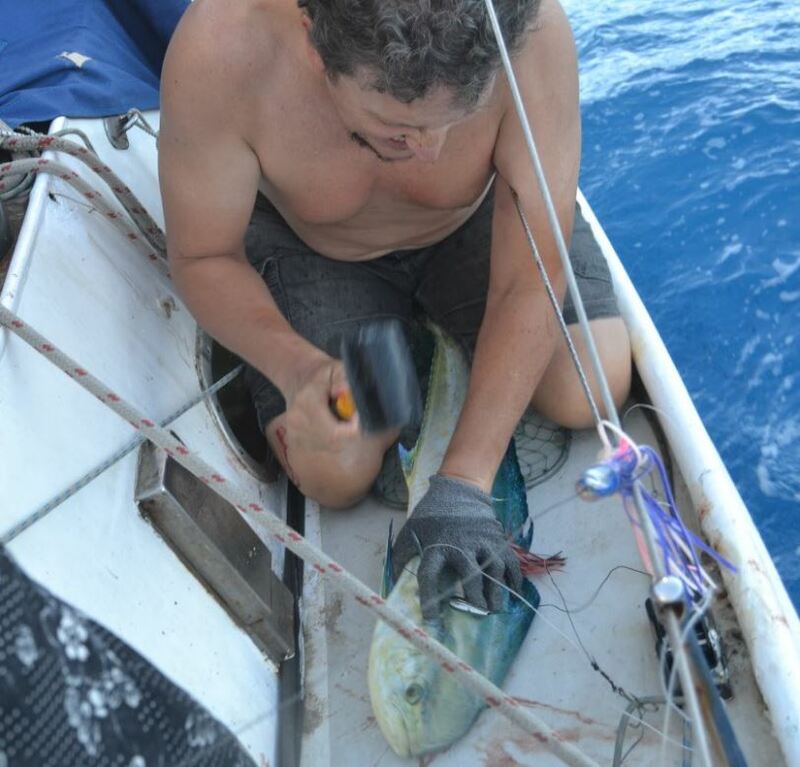 but I am not going to talk about just any time that we caught fish but THE Mahi-mahi operation. Now we all agreed that the crossing from the Galápagos to the Marquesas was to be the time when we where supposed to catch fish. We put the line out every day until I thought there where no fish in the ocean. So when Franci and I were bringing in the line we where not expecting a fish…BAM! To our surprise, there it was. Sadly it never made it on board. The fish gave a great leap in the air and twisted itself off the hook… no fish for us that night. The next day we caught one on each line at the same time. And… lost them. Again, we failed in catching our dinner. Again we tried. We caught a Mahi-Mahi, pulled it one to the boat, but didn’t manage to get it into the frying pan as it thrashed wildly and jumped back into the ocean. So we had to wait another day. I thought we weren’t good at fishing, but now I knew. Yet, despite our dampened spirits, we lowered our lines again the next day. The lines snapped taught. We had fish yet again! Franci and Dad tackled the one line furiously. We were determined not to lose dinner again! As Franci and Dad tackled the line I was called up by the now familiar cry of ‘ONS HET ‘N VIS!! ONS HET ‘N VIS! !’ (we have a fish, we have a fish) as Karin ran down to fetch the camera. Of course everybody was now in the cockpit, maybe today would be the day, we finally caught… dinner. My Dad was wrestling the fish the keep it one board. Now he was on top. Now the fish was on top. But at last he conquered it. Sitting on the fish to keep it still while hacking it with a hammer. Marike, meanwhile, was checking on the other line. Just in case, you know. She felt a strong pull and a yank she. On by our vas experience and knowledge on the subject, she knew instinctively… there was a fish. She kept it trailing in the water until Dad could come and help. You wouldn’t believe how strong those fish are. The next day, we put out lines, excited by out victory the day before. 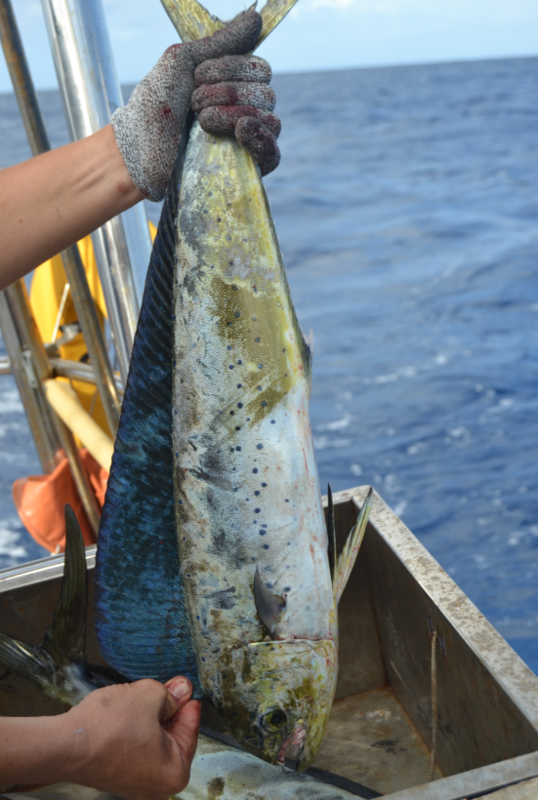 We caught one mahi-mahi with much excitement, bordering on blazé. We now had a lot of fish, yet foolishly, the next day we put the lines out again. Franci was now addicted. We never saw him, we never saw him strike. But time after time he left his mark. First, one lure disappeared. We reaplaced it carefully tying the knot and checking the hook. But then, both lures disappeared, chomped off by his menacing jaws and hungry desire for squid lures…. And that concludes the Mahi-mahi operation. Reading your blog with great interest from Arizona, USA. We are anxious to see what you post about Vakaeitu, site of “Daviid’s Tongan Feast” near Vava’u where we met the crew from Shang Du. We return in ten days to Vava’u where our boat is on the hard. Great job guys!!!. Does the fish taste nice?